Experience East Africa’s landscapes and wildlife at their finest on this independent itinerary, embarking on game drives through majestic national parks and reserves in Kenya and Tanzania, keeping watch for the famous “Big Five,” and visiting a Maasai village and a local primary school supported by A&K Philanthropy. Amboseli is not a large park but it does offer you the best chance of seeing the endangered black rhino. It also has huge herds of elephants, and to see a herd of them making their way sedately across the grassy plains, with Tanzania’s Mt. Kilimanjaro in the background, may be a real African cliche but it’s an experience which certainly leaves a lasting impression. Ngorongoro features stunning views and spectacular scenery. This is the perfect stopover between the Serengeti and Arusha. Serengeti is Tanzania’s most famous game park. Here you can get a glimpse of what much of East Africa must have looked like in the days passed. On the seemingly endless and almost treeless Serengeti plains are literally millions of hoofed animals. They’re constantly on the move in search of grassland and are watched and preyed upon by a varied parade of predators. It’s one of the most incredible sights you will ever encounter and the numbers involved are simply mind-boggling. 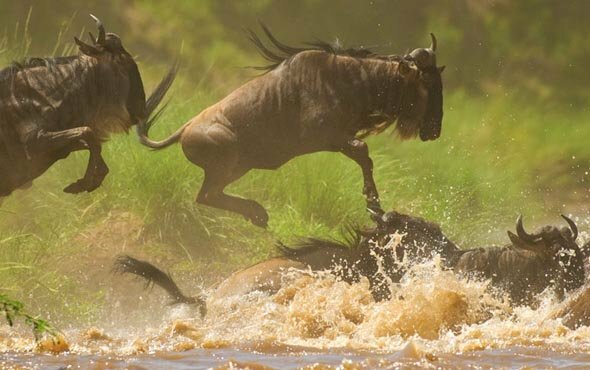 The wildebeest has a starring role in the amazing annual migration. Serengeti is also famous for its lion, cheetah and giraffe populations. Don’t forget to bring your binoculars.